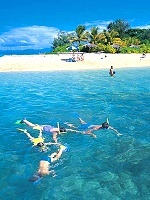 Day trips to the Outer Great Barrier Reef are a great choice for the diver or snorkeller who is short on time. There are a huge variety of trips on offer, similar in many ways but after close examination differ slightly. Most day trips focus on the Inter Reef Gardens, heading off to places like Green Island, Michaelmas Cay, Fitzroy Island, and reefs in close proximity to these places. However having said this some operators have sleeker and faster vessels that enable them to get out to the Outer Reefs in one day. Some tie up to a mooring (permanent place marked by marine parks so that anchors are not used) and some vessels commute to huge pontoons/platforms permanently placed on the outer edge of the reef, and offer a huge variety of options to view the reef, especially good for the non water person. Generally the latter carry more people, because of the extra services that they offer, and in turn attract a more varied clientele. Other day trips are far better for experienced divers and fairly confident swimmers. Some are what we like to call dedicated dive boats with very few concessions made for the non-swimmer. Day boats usually depart the marina at approx 8.00am, returning at approx 5.00pm. Some include morning tea, lunch and afternoon tea, and some (to keep costs down) charge extra. Some operators include basic equipment and some include the whole kit. Again some charge extra to keep costs down. 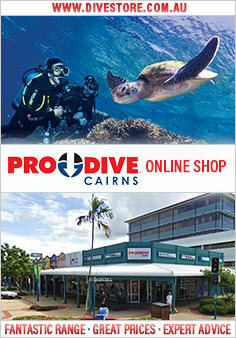 As far as diving goes some packages include 1,2,3 dives where as another may charge extra for the dives. Extras can also include introductory dives, snorkelling tours, semi-submersible rides and glass-bottom boat rides. When you come to selecting a day trip that suits your needs make sure you weigh up your needs and then cross check it with your budget - it pays to do a little homework. Rest assured that all trips mentioned in this site have been tried and tested many times, and have been chosen as the best available.